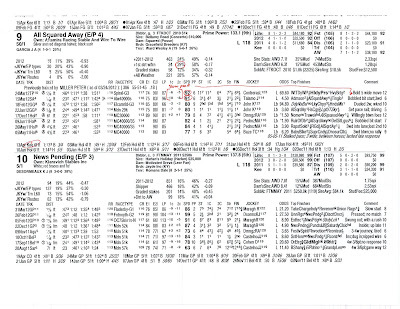 Publicly picking (or at least tweeting) a 70-to-1 winner of a graded stakes race is a lot like performing a magic trick--some are impressed and others want to know how you did it. Unlike a magic trick, however, picking such a winner is difficult to repeat. 70-to-1 shots do not win that often (1.4% if the odds are actually correct), and even when it happens again, it's not like I'll necessarily be on it. If I'm 70-to-1 to pick a 70-to-1 horse who wins then the odds are actually 5,040-to-1 of it happening, but that's still a better chance than I have of making the Statue of Liberty disappear. And besides, the important thing is I had this one: All Squared Away to win the Lexington Stakes. 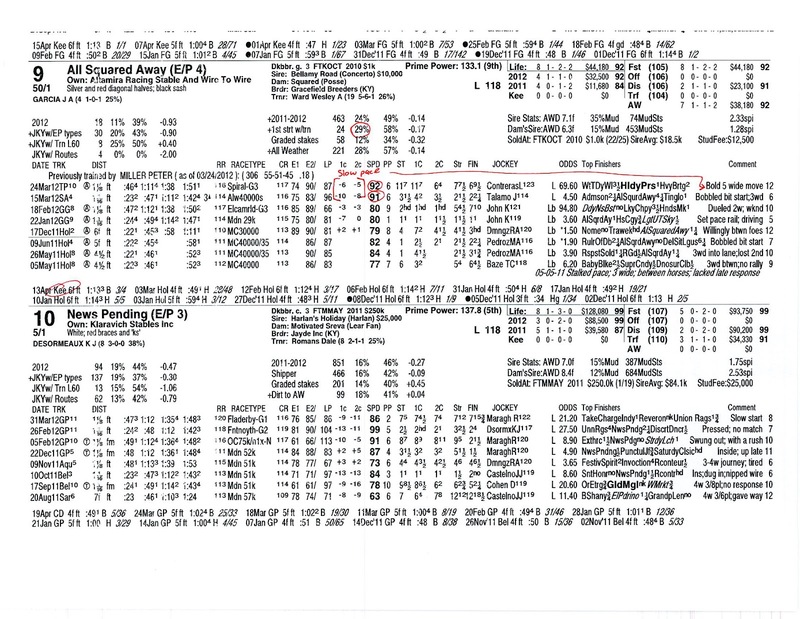 And the lesson here for those asking how I landed on this one is not dissimilar from what I took away from Dullahan beating me in the Toyota Blue Grass Stakes: The most important element of handicapping a horse race is asking not "Who will win?" but "Who can win?" One of the biggest mistakes people make when handicapping races is asking the question, “Who will win” rather than “Who can win,” and it is the rationalist that [Andy] Beyer speaks of who will look at the numbers and be able to determine who is too slow to contend. 2. first-time trainer Wesley Ward (a 29% win/58% in the money angle according to the aforementioned PPs. 3. Those two low 90s BRIS Speed Ratings were both earned closing into a slow pace, which I did not think would be in play in the Lexington. There were some negatives, too, of course: The outside post was a concern given posts 8 and beyond had won just 4% of the races going 1 1/16 miles at Keeneland, and finishing sixth and seventh beaten a combined 19 1/2 lengths in two graded stakes tries didn't inspire, but again, how much inspiration do you need at 50-to-1? The three positives above told me the horse could win, and at that price I had to take a shot. In the end, 10% of the money I bet on the Lexington Stakes was on All Squared Away, so it's not as if he were my top pick in the race, but successful betting requires the handicapper not to get enamored with who will win. It's a great lesson to bring with you to the track--especially on Kentucky Derby day when so much importance is placed on WHO WILL WIN THE KENTUCKY DERBY. It's a satisfying question to get right, and I'd love to see I'll Have Another win for that reason but not at the expense of a horse I've bet at 40-to-1 because he can win. Congrats Ed, you have mastered the key to exotic betting. That is the whole point of the A-B-C-X matrix. The only horses you exclude are X horses. All others get played using their odds relative to your assessment of their actual chances. At 70-1 you don't have to crush one to cover the 90% of the bankroll you played elsewhere. But hey, you are the one who turned me on to the Crist book. So...one minute before post time (5:13) you send out a tweet about blowing up the toteboard with All Squared Away. Nice call, but it might be more helpful for the rest of us, unless your worried about your legions lowering the odds, for you to send out these tidbits a little bit earlier than 1 MTP. May the horse be with you. You gave me a tip just before the start of the Keeneland meet on the sucess of Wesley Ward with first time starters. I played a small win bet Saturday on All Squared Away only on a hunch based on the success of Ward. I am now bankrolled for Kentucky Derby weekend and the Players Pool. Just wanted to say thanks! Thanks for the insight Ed, I was curious about the process of picking this horse and when I went back to the PP's I saw some positives that I will look for in the future.Your statement on the difference in thinking about Who can win the race vs Who will win is key. I have been trying to make that adjustment in thinking. Great work and good luck! Love this: "The most important element of handicapping a horse race is asking not 'Who will win?' but 'Who can win?'" I completely agree. It is a probability-based game; nothing is etched in stone. Good little article Ed..first reply stole my thunder...was going to reply with ABCX scenario i use (rehashed), which i think answers your exact questions, "who can win". My X's come first...can NOT WIN. Can generally get rid of half the field most of the time. Then its just a matter of C-B-A's and betting strategy/pricing. So simple in theory:) SB. In All Squared Away's last start, he found himself at the first call in the worst position of any of his prior 7 starts. He proceeded to overcome this disadantage by passing horses from the 1/8 pole home for only the second time in his career. The other was his maiden win. Thus a possible sharp horse switching to Ward. Question: Why is he in this race in the first place?